Very thoughtful piece Matthias. What impressed me as well were your comments which followed the article. It’s almost unheard of these days to see anyone give Jack Kirby credit for being much more than something close to an idiot savant in terms of the whole content of his work. Rather than the usual head-hung foot shuffling seen when most people talk about Kirby as a serious creator, you unabashedly confront the common argument Kirby was all about things like crackle and that his narrative content is bottom of the barrel, even within the banal confines of mainstream super hero comic books. There are occasional diffident appraisals of Kirby’s work which suggest it is “operatic” a coded way of agreeing with the consensus it’s over the top. You see other variations on this; frantic, crazy, wild. And again, these are descriptions being applied to work done in the context of mainstream super hero comic books. Unless I misread your comments (and they seem clear to me) you are taking the conventional wisdom bull by the horns and turning it on it’s head. There are a lot of reasons why Kirby’s subtext is either missed completely, or misunderstood. 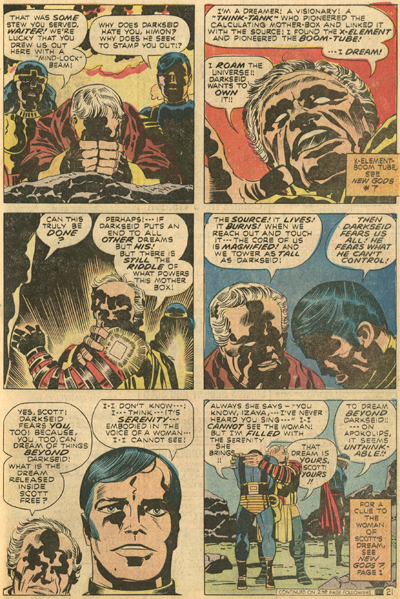 As you point out there is a real tension between the stories Kirby passed on to Lee in penciled form, and the stories which eventually saw print after Lee had rewritten them. Routinely Kirby’s intent was subverted by Lee in large and small ways. A good example is Kirby’s Silver Surfer character which he intended as a fallen angel. An emotional blank slate cast down to Earth for defying God. In Lee’s disjointed rewrite the character became an illogical cross between a wandering holy man and an advance scout who had been blithely assisting in the destruction of whole worlds. A more widespread example would be Lee’s sexist treatment of women. As opposed to the strong women characters evident in Kirby’s Romance stories, or even things like the Challengers of the Unknown where a recurring woman character is frequently involved in plots. The woman is not only more intelligent and better educated than any of the men, she is independent and uninterested in becoming a member of their team. 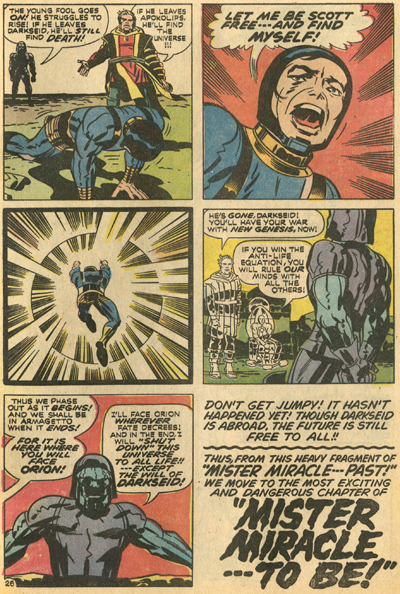 Kirby’s ’60s era border notes show frequent instances where Lee has softened Kirby’s women, not only in the text, but by directing the inker to “pretty-up” the faces of women, or to change an expression from confident to fearful. “He’s the kind of guy who will go through life trying to make something good out of it. Kirby is always aware though that realization can be completely subordinate to other factors. There is a black kid in his SILVER STAR story who is one of the GMO humans being sought out by both Darius Drumm and Morgan. This kid is something like the appealing character named Tatta in Tezuka’s Buddha. He’s aware, but he’s so centered on revenge it outweighs everything else. The boy’s mother was an innocent bystander cut down in a street gun battle. His feeling is his street is his world, and though the world outside his street might be threatened by Drumm he doesn’t care, because the world outside his street doesn’t care about his street. And so he’s focused on using his GMO abilities to clean up his world. The beauty of it is like Buddha’s eventual acceptance of the fact he couldn’t change Tatta, Kirby is not judgmental. There is a sympathy in his attitude towards people based on man’s fundamental character. You can see this when Kirby talks about the Holocaust. He says things like “we were putting people into ovens.” The understanding being that the potential for evil is inside all men and it’s circumstances most people respond to. Anyhow, there is a great deal of thought behind his work, it isn’t at all hot-dogging for no constructive purpose, there is no showboating. It seems to me a cartoonist ought to be able to cartoon. The opportunity to caricature not only faces and figures, any object to be drawn, but also the opportunity to caricature personality and other narrative elements, is one of the best tools in a cartoonists bag. I think there is an element of self-conscious shame associated with reading comics. It’s the awareness many people feel that it is a children’s medium, or perceived as one. One of the reactions based on this feeling is many fans have come to think comics are somehow elevated by attempts to make them more like contemporary film or television. This attitude is confined mainly to mainstream comics (super heroes) and common perceptions of them. It’s been going on for some time. As you noted is Kirby not very well respected even within the confines of “comics.” There may be occasional comparisons to Homer; I don’t know if I’ve seen that. 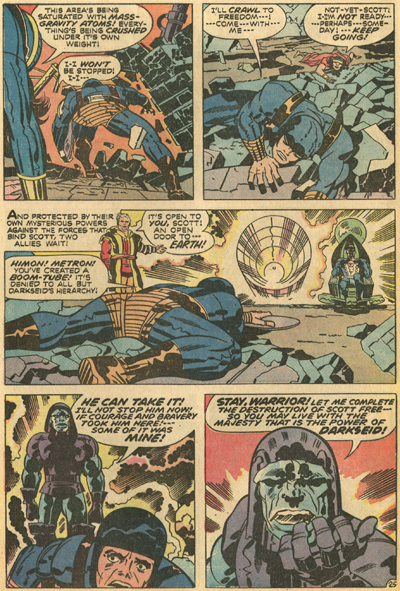 On the whole though with Kirby his art style has been out of fashion since the end of the ’60s. As early as the ’70s fans were much more impressed with art work they saw as realistic (say Neal Adams), and a writing style which seemed as if the authors were watching something like HILL STREET BLUES and decided the X-MEN would work better if it were something like what they were watching on TV. My observation is that with rare exception Kirby is not only not respected, he is probably ridiculed more harshly than any comic book creator I can think of. This contempt for his work is so entrenched that people who take his work seriously are typically dismissed as deluded cultists. Thanks for your kind words and response! Kirby is a strange case in comics in that he’s widely revered but not so much really for the qualities you outline, or at least not overtly. 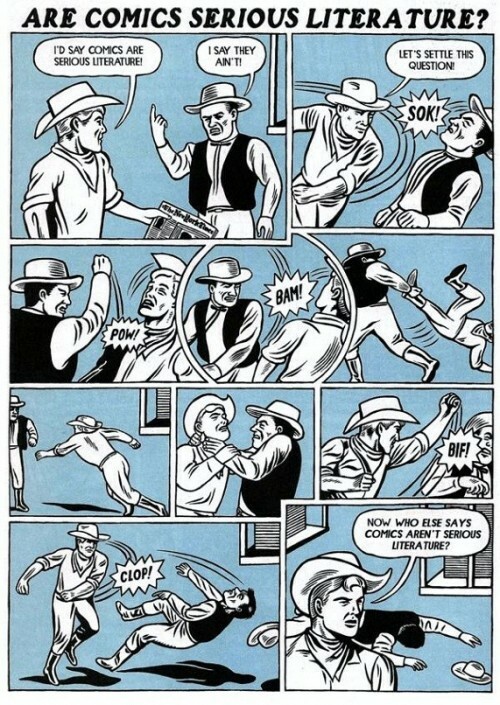 I guess that was one of the points I was trying to make with the essay: that many of these old mainstream comics offer much more than it would seem at first glance, if one looks a little more carefully. Matthias, There really isn’t any reason a person should go looking carefully at genre material designed for kids. If a person is looking at all they may as well at least give the material a decent reading. If a person is bothering to pay attention at all to genre material the way to look at it is seeing the conventions of the form as part of the creators work materials. You don’t look at a photograph in THE DECISIVE MOMENT and criticize it because it isn’t a film. You don’t look at a B&W etching and wish it was a painting. I think we know that giving one person a pencil and a sheet of paper and a suggested subject and another person a whole box of art supplies and unlimited freedom does not measure into which person will be the most creative. Probably the most universally respected cartoonist is George Herriman. Herriman already restricted by deadlines, format, the other limitations of his job. In the area where Herriman had the greatest freedom he chose to embrace variations on a Mouse-Cat-Dog set-piece as the basis for his decades long run of KRAZY KAT strips.